The most popular image of Queen Victoria today is the one shown in late 19th c. photographs: a short, stout, elderly woman in widow's weeds, staring grimly away from the camera. But it was a much different queen that captivated her subjects early in her reign. Victoria was only 18 when she was crowned queen in 1837, and 21 when she married Albert of Saxe-Coburg and Gotha. She was painted, drawn, and engraved to show her to flattering advantage as a small, slender, and pretty young woman. The majority of the country would never see her in person, and in those days long before television, this image of the elegant queen was the one that was accepted and revered. It was also an image used to sell everything from fashionable clothing to soap. The young queen's reign coincided with technological advancements in wood engraving, and color printing (chromolithography) in the 1840s that made illustrated news and culture magazines like the Illustrated London News and Harper's Weekly both more affordable and more lavish. Gone were the days when prints were laboriously and often crudely colored by hand. Now consumers wanted color illustrations on everything, and publishers were happy to oblige. These same middle-class consumers were also buying pianos for their parlors and sheet music to play on those pianos. There was an explosion of new social dances to learn - waltzes, polkas, and quadrilles - plus themes from popular plays and arias from the latest operas. To entice buyers, sheet music for these pieces was titled with names that would tie them to popular public figures, political events, exotic locations, and even scientific discoveries, and printed with beautiful illustrations on the covers. The sheet music for The Camp Polka, above, combines several trends. Printed in London in 1853, the illustration shows the summer camp on Chobham Common in Surrey. The Chobham Camp was the scene of the first large-scale military maneuvers in England since the Napoleonic Wars. Patriotic fervor is usually at its highest right before a war. With the Crimean Wars looming in the future, the spectacle of 8,000 men and 1,500 horses drew crowds of spectators - including Queen Victoria and Prince Albert. 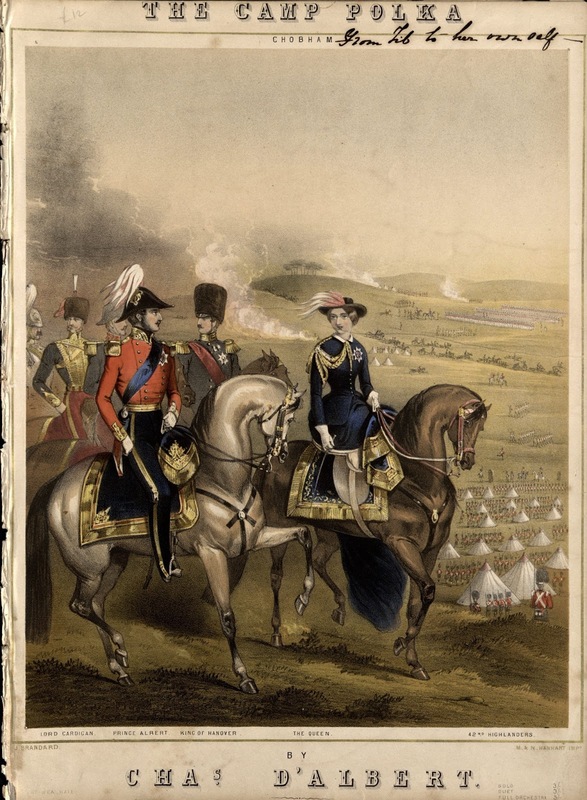 Here the stylishly uniformed queen and prince, riding on spirited steeds, are shown surveying the camp in a neatly arranged show of British might and military prowess. Patriotism, royal celebrities, and horses: what better way to market a polka? Many thanks to Andrea Cawelti, Ward Music Cataloger, Houghton Library, Harvard University, for her assistance with this post. Above: The Camp Polka by Chas. d'Albert, sheet music for solo piano. Lithographed by John Brandard, published in London: Chappell, 1853, by M.& N. Hanhart. Harvard University Library. And, of course, she is riding side saddle. I have NO idea how women ever managed that (I believe the current queen also rides side saddle on state occasions). Who Drives in Rotten Row?